Use your legs and explore Philadelphia’s architectural past, present and future during a guided walking tour with the Preservation Alliance. On Wednesday, June 22 at 6p.m. the Preservation Alliance for Greater Philadelphia will take you on a two-hour tour through various sections of the city including: Society Hill, Rittenhouse Square, Fishtown, Girard Estate and Chestnut Hill. Along the way you’ll learn about region’s architectural heritage and social history. This is a great summer activity for the whole family because it gets you moving and learning. For a tour schedule click here. 6:00 p.m., $10 for adults, $8 for students, more information here. On your way home from work today bike on into the Green Line Cafe for some refreshments from the Bicycle Coalition of Greater Philadelphia. 4:30 – 6:00 p.m., Green Line Cafe, 4239 Baltimore Ave., more information here. 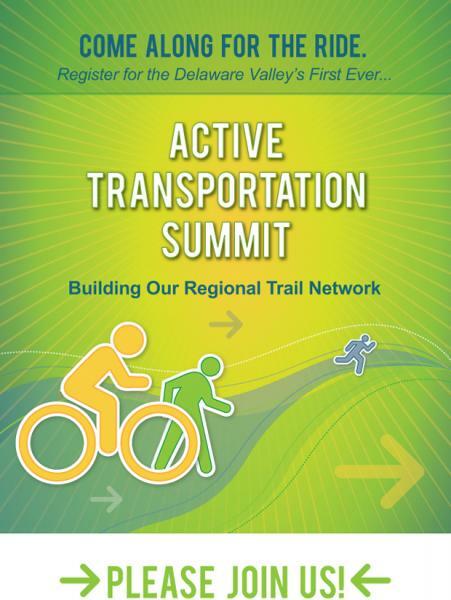 The PA Environmental Council and Delaware Valley Regional Pllaning Commission have teamed up to host the region's first summit highligting the area's expanding trail network. National leaders in the health and economic development fields will discuss spurring economic growth through trail growth, and provide updates on current in-the-works trails, parks and bikeways. 8:00 a.m. - 5:00 p.m., The HUB at Cira Centre, 2929 Arch St., Mezzanine Level, more information here. Learn to plant a fragrant, bug-busting garden and how to use those plants to make your own natural insect repellent! All participants will leave the workshop with new found knowledge, and an insect repelling plant in hand. 1:00 - 2:00 p.m., City Planter, 814 N. 4th St., to register, email info@cityplanter.com or call 215-627-6169. Committee’s fund, the other half will go to the Peace and Social Concerns fund of the Chestnut Hill Friends Meeting. Items accepted include computers, printers, TVs, audio equipment, cameras, cell phones, DVD players, VCRs, and telephones. For a complete list of items e-mail weaverswayrecycling@yahoo.com. Volunteers are needed; email weaverswayrecycling@yahoo.com. 10:00 a.m. - 2:00 p.m., Chestnut Hill Friends Meeting parking lot, 100 E. Mermaid Ln. Kimberton Whole Foods will be hosting a movie night event featuring the film “The World According to Monsanto,” to continue the promotion of Non-GMO products, as well as to kickoff their 25th anniversary this summer. “The World According to Monsanto” is a documentary film that gives the audience an insider look into the practices of US agricultural corporation, Monsanto, who is known to use and promote genetically modified organisms. 5:30 - 7:30 p.m., Kimberton Whole Foods community room, 2140 Kimberton Rd., Kimberton, reserve your spot here.